This relatively new company in our industry is managed by husband and wife team, Tony and Yumi Sullivan. The family has over 60 years experience in the textiles industry, with Tony being the third generation to be involved in Fabrics. Tony established Victorian Textiles Pty Ltd after many years of groundwork traveling throughout Victoria and New South Wales as a salesman covering more than one million kilometers during his time on the road. By simply listening to customers Victorian Textiles Pty Ltd was born from necessity. Tony's twelve-year sales apprenticeship with many of the large textile and notion distributors In Australia provided him with the opportunity to recognise some of the deficiencies in the current supply of patchwork products. With grass roots as the foundation and an overdose of common sense, Victorian Textiles Pty Ltd was built and is now considered one of the best suppliers In the Industry, locally and now world wide. Our staff are highly qualified with varied backgrounds from owning and operating a retail business to teachers and long arm quilters. Victorian Textiles Pty Ltd has shown a propensity to listen and Implement constructive change leading to Exports around the world including USA, Canada, New Zealand, Germany, Netherlands, Denmark, France and Italy. 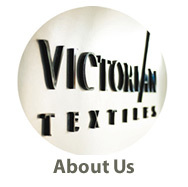 Victorian Textiles was incorporated on July 1st 2000 and continues to enjoy growth to this day. Please be aware that Victorian Textiles only offers wholesale trading - we do not sell direct to the public.